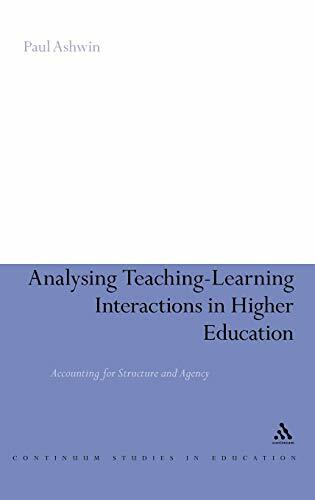 [PDF] Analysing Teaching-Learning Interactions in Higher Education: Accounting for Structure and Agency | Free eBooks Download - EBOOKEE! Description: Whilst current research into teaching and learning offers many insights into the experiences of academics and students in higher education, it has two significant shortcomings. It does not highlight the dynamic ways in which students and academics impact on each other in teaching-learning interactions or the ways in which these interactions are shaped by wider social processes. This book offers critical insight into existing perspectives on researching teaching and learning in higher education and argues that alternative perspectives are required in order to account for structure and agency in teaching-learning interactions in higher education. In considering four alternative perspectives, it examines the ways in which teaching-learning interactions are shaped by teaching-learning environments, student and academic identities, disciplinary knowledge practices and institutional cultures. It concludes by examining the conceptual and methodological implications of these analyses of teaching-learning interactions and provides the reader with an invaluable guide to alternative ways of conceptualising and researching teaching and learning in higher education. 2012-03-14Mike Keppell, Kay Souter, Matthew Riddle, "Physical and Virtual Learning Spaces in Higher Education: Concepts for the Modern Learning"
No comments for "[PDF] Analysing Teaching-Learning Interactions in Higher Education: Accounting for Structure and Agency".